All I have to do to burn 4000 calories each day is walk 10 kilometres! 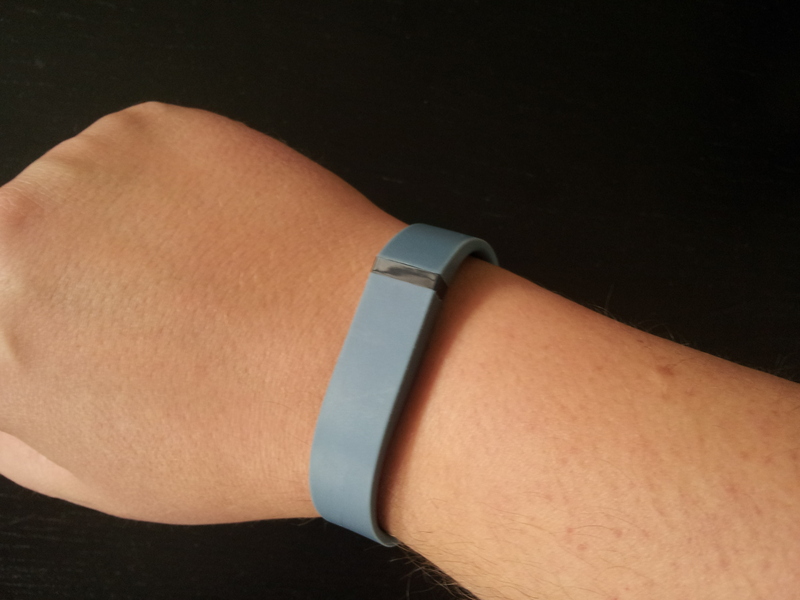 I recently was given one of these little Fitbit tracker things as a gift, and I’m quite fascinated by them. Basically, it’s a little computer chip inside a bracelet that you wear at all times, and this one I have, the Flex, measures your steps, kilometres travelled when walking, calories burned each day, and the amount you need to burn and eat based on how much weight you want to lose in a certain time. It even measures your sleeping habits – turns out I’m about as rubbish at sleeping as I thought. The thing I like about this is that it does take things like weight into account with calorie burning, something that a lot of machines at the gym often don’t. So, due to the fact I’m considerably bigger than my girlfriend, naturally I burn calories a lot faster than her even if we do the same exercise. Lucky me, I guess. My stats from yesterday – there are more than this, but these are the ones based on goals for each day. What I didn’t realise, though, is how many calories I can burn quite easily. The starting goal is to walk 10 000 steps a day, which is roughly 8 kilometres (or 5 miles) – it measures steps and distance separately to counter for different step sizes. We’ve decided to aim for 10km per day instead because it’s really quite achievable for us, but by walking this much I am burning over 4000 calories in a single day. I can eat quite well all day and still keep my calorie intake below 2000, so hopefully the weight should fall off as long as I keep the food I’m putting in healthy. I guess this all shows the way my mind works. 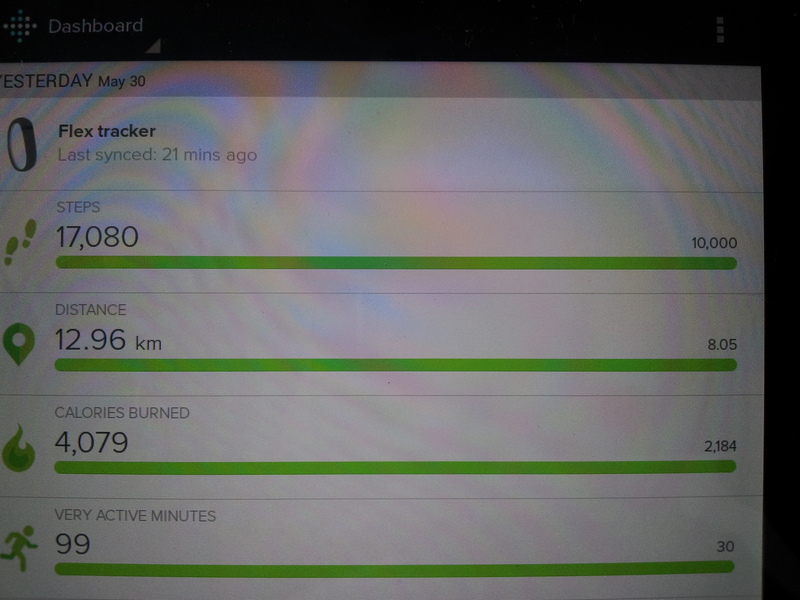 Somehow, seeing the numbers like this appear on a screen (you connect the fitbit to a phone or tablet to see your stats each day) not only helps me to keep track of what I’m doing but also motivates me to keep at it. I’ve resisted junk food a lot more these past few days as a result, which is awesome in itself. And when I start losing weight and my calorie burning slows down a little (because I’m not as big), I can use it to stay focused to go all the way towards being healthy. And then, when I’m healthy, I’ll feel like I can throw myself into various parts of my life more fully! Hooray! So, my question to my readers is, what motivates you to become or keep healthy? Have you used a device or app like this? This entry was posted in Stuff about me and tagged Calories, Fitbit, Fitness, Health. Bookmark the permalink. I used Livestrong (the iphone app) for a little bit to track my eating and exercising habits. But I found it utterly useless and tiring 😦 I have friends using devices from Jawbone that sound similar to the Fitbit trackers, and they seem to have positive feedbacks in general. I downloaded an app that calculated my calories in accordance to my weight loss goal. I found I snacked less but wasn’t losing the weight. I plateaued and quit the app. I never counted calories prior to the middle years. Now I pass a cupcake and earn 30 calories for even considering a second glance. Hahaha I know that feeling – I used to be able to eat nothing but junk food all day and still be fit as a fiddle, but these days it’s a lot harder. What is scary is the calories in things you don’t always expect – some foods I thought weren’t so bad are actually pretty terrible. And then some things are more obvious, like cutting down intake of bread and pasta and other carbs. Having past my thirties and then some I applaud your wisdom for getting into good habits now. Calorie problems weren’t a problem until forty knocked on my door one day. So much for the all you can eat buffet days! Yes I have, I quite like the iPhone/Nike running app. There are 3 commonly seen issues with ‘Calories burned’ information: They inflate the numbers (4000? Impossible), they don’t subtract Calories you would have burned anyway, and they don’t factor in the increased hunger from doing all that fantastic exercise. Having said that, I love jogging, I love the chance to spend a (hopefully) long time out on the road, listening to music I’m not allowed to listen to at home! P.S. Robert Lustig is a genius. Nike have a running app? How interesting, and also very clever marketing. The calorie information on this app is actually way more complex than I showed with the photos or explained in my post. You can see your calories burned for each 15 minute period over the day, so you can see it go up and down from when you’re resting to when you’re moving about more – for me, powerwalking is burning an extra 500 calories (roughly) per hour on top of what I already burn. 4000 sounds like a lot, but then I have 25-30 kilograms to lose and I’m a big person to start with (as in both tall but also a big body frame), so I do burn calories really fast compared to your average person. Of course, this figure will come down as I lose weight, probably down to a more normal 2500-3000 calories a day if I work out each day. But it’s definitely possible – I’ve met some athletes who have to eat 5000+ calories of food every day because of how much they burn during their training. I can’t even imagine eating that much. I’m not sure what motivates me exactly, but I do like fitting nicely into my clothes for a change. I used a GPS app back when I tried my hand at jogging, but I wasn’t enjoying it. Now I stick to slow carb six days a week and I do some exercise with weights at home around twice a week, logging the sets on my fitness app. Haha yes – clothes are always a good motivator. I have a lot of clothes in a size smaller than I currently am, but they’re back in Australia right now. Maybe if I fit into them soon I’ll ask my parents to go into my storage and send them over to me.